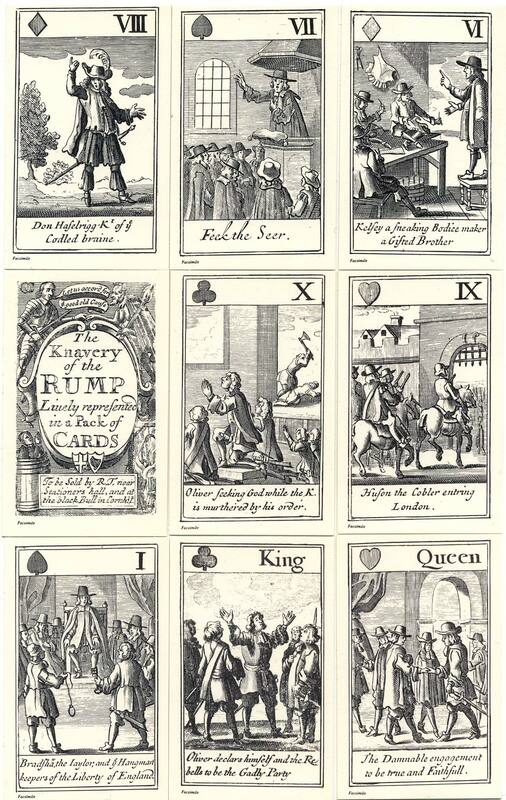 The Knavery of the Rump engraved playing cards, first published in 1679, are a satirical portrayal of Oliver Cromwell's Government during the period of the Rump Parliament 1648-53. The illustrations on the cards provide a rare visual impression of the times. We see not only the military warring factions, but the humbler souls of town and countryside in traditional dress. 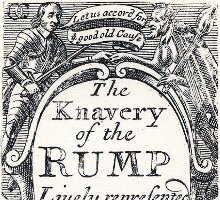 The title card (second row) is inscribed The Knavery of the Rump, Lively represented in a Pack of Cards. To be sold by R.T. (Randal Taylor) near Stationers Hall and at the Black Bull in Cornhill. The backs are plain. This pack was engraved from designs by the artist Francis Barlow, and a copy of the pack was owned by Lord Nelson. 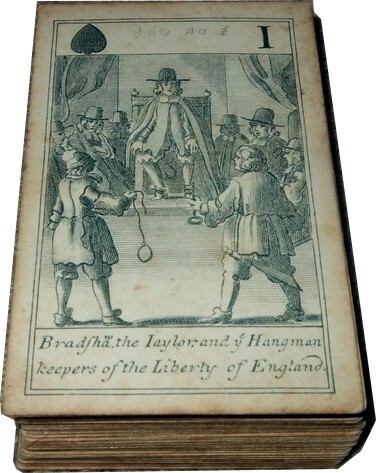 A large number of such educational packs were published during the 17th-18th centuries. A facsimile edition was published by the Aungervyle Society, printed by E. & G. Goldsmid, Edinburgh in 1886 with coloured backs and titled “A Pack of Cavalier Playing Cards”. A modern facsimile of this very rare pack is part of a range published by Harry Margary. The Goldsmid Facsimile edition of 1886 titled “A Pack of Cavalier Playing Cards” can be viewed online: here (Project Gutenberg).